Front Squatting – it’s a lot like New Year’s resolutions – everybody talks about adding this movement to their training, but by ‘February’ the Fronts drift into training limbo. It’s too bad. Properly and faithfully performed, the Front Squat absolutely works the quadriceps like next to nothing else you can do for yourself in the gym. Powerlifters and weightlifters, for the most part, ignore all species of leg machines, relying on the back and front squat for all leg work. (Weightlifters and other ‘functional’ trainers often use the Overhead Squat as well). 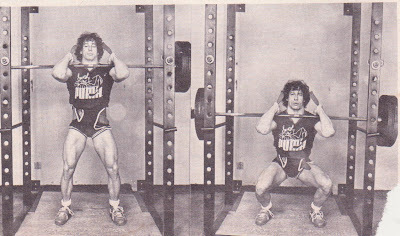 More than almost any other lift, the Front Squat can be painful in higher reps, and, when going heavy without benefit of a rack, can be dangerous for those who haven’t yet learned how to dump a bar. Or when a rack IS present, dangerous to anyone who happens to spend time sitting around nearby. Item: I witnessed a spectacular accident involving a lifter who was attempting to triple with a 364-lb. Front Squat. Totally losing control coming up on the second rep he dumped the right side on a fortunately large powerlifter who was at the moment busily engaged in an exaggerated reminiscence of the last night’s date. The plates were bumpers, so what turned out to be a fractured shoulder could otherwise have been a jagged amputation. For ‘comfort’ when doing higher rep Front Squats I use straps (see photos), for a good, lasting grip, giving me more control. Without straps, many lifters find maintaining a solid rack on sets of more than 5 reps to be the main reason for cutting their efforts short. 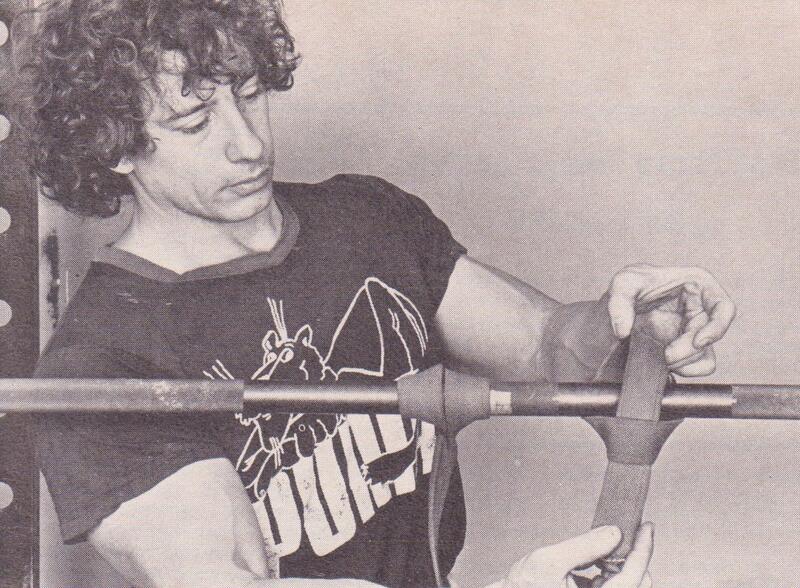 George Frenn on occasion would attempt a truly massive lift – 500 lb. Front or 700-lb. Back Squat – WITH NO WARMUP. He would simply walk into the gym, load the bar and go. Frenn termed this technique ‘shocking the body’ and the concept delights the psyche of the champion, while sending shudders of fear up the less ‘adventurous’ lifter’s backbone. Not really recommended, but worth noting. If you've decided to use higher repetitions in the Front Squat for a time and have also found your rack is causing you problems, give the straps a try.